It’s Surgery Day for Shawn! On June 20th, Shawn R from Florida will be undergoing the 2nd step of her 3 step process of breast reconstructive surgery and transformation on her way to closure with Dr. Antonio Gayoso in St. Petersburg. 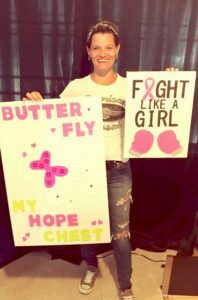 Women who apply to My Hope Chest for help have often overcome more than just a cancer diagnosis by the time they reach or charity… they have survived the loss of limb, often loss of job and in the worst cases, and they do happen, loss of home and husband. Surgery day is an amazing moment in our client’s life when she feels that much closer to closing the chapter of the cancer journey. That’s our mission .. to help women be finished with thinking about cancer and on to moving forward with their lives. We are over the moon and stars happy for Shawn’s next step to closure from the disease, so join us in celebrating. Please be sure to follow her journey on our facebook page too…. the more who learn of our mission, the more women we are able to help! And of course, your donation to help us fund these expensive processes.